Snorkeling in Costa Rica, Snorkeling Tips and Tricks, and Where to go? Costa Rica is one of the most biodiverse countries in the world. On land you’ll see incredible flora and fauna in wet and dry tropical rainforests, majestic mountain ranges, raging rivers and flowing waterfalls. You’ll see sloths, monkeys, tropical birds and thousands of insect and reptile species. And Costa Rica’s biodiversity doesn’t end on land. Off of the 800 miles of coastline you’ll find diverse marine life swimming around enchanting coral reefs. This means that Costa Rica if full of great snorkeling opportunities. Snorkeling is a can’t miss activity during your Costa Rica vacation. Snorkeling in Costa Rica means swimming among sea turtles, whales, dolphins, manta rays, moray eels, sharks and brightly colored schools of tropical fish. There are over 7000 marine species around Costa Rica. Some of the tropical fish include Butterflyfish, Parrotfish, Puffers, and Barracudas. The clear, blue and calm waters provide the perfect conditions for snorkeling. If you’re traveling with kids, you’re in luck! Snorkeling is a perfect activity for families. Many hotels also offer snorkeling gear or even a snorkeling tour.Most of the snorkeling spots in Costa Rica are also perfect for scuba diving. Divers can find beginner-advanced dives, but remember you must be certified to go scuba diving! Most snorkeling tours last 3-4 hours and the gear is included. Make sure to grab a fitted mask– one that is comfortable and won’t fog up when in the water. A dry snorkel is always good to have; snorkels can come with either an open top or have a special valve that closes when fully immersed in the water. Also, it’s very important to have fins that fit, if too tight they can leave your feet sore and swollen, and too big they potentially could fall off. You should also come prepared with water, snacks, sunscreen and an underwater camera. Keep reading to learn more about where to snorkel in Costa Rica! Don’t miss the snorkeling tour in Cahuita National Park. It’s off the southern Caribbean coast and is home to over 35 coral species and 240 marine species. You’ll hike through the national park to Punta Cahuita, where you’ll start your snorkeling tour. Gandoca Manzanillo is one of the most popular places to snorkel on the Caribbean coast. Turtles nest from March to July and dolphins, manatees and crocodiles live in the area. Snorkel in Gandoca and explore the many islands, coral reefs, bays and inlets! If you’re enjoying one the many all inclusive resorts in Guanacaste, it’s worth your time to visit the Papagayo Peninsula snorkel in the calm, protected waters. There are over 400 wildlife species to admire! Catalina Island is off of Flamingo Bay in Guanacaste and is famous for volcanic rock formations that attracts diverse marine life. Snorkel off of Catalina Island and spot sea horses, sea turtles, octopus, eels and white tip reef sharks. Golfo Dulce is famous for its large population of spinner dolphins. It’s also known for a unique marine ecosystem; the reefs are so full of diverse marine life, you’ll need more than one snorkeling trip to see it all. Visit from July-September to see a humpback whale with her calf! You might also get to see a whale shark. Caño Island (Isla de Caño) is one of the best destinations for snorkelers in the country. The clear blue waters are full of marine life. You’ll swim next to eagle rays, bright tropical fish, turtles, sharks and maybe even humpback whales! The incredible snorkeling off of Caño Island is definitely worth the 1.5 hour on a boat. Tortuga Island is yet another snorkeling hot spot in Costa Rica. The tours offered generally include lunch and other activities like kayaking, horseback riding and hiking. 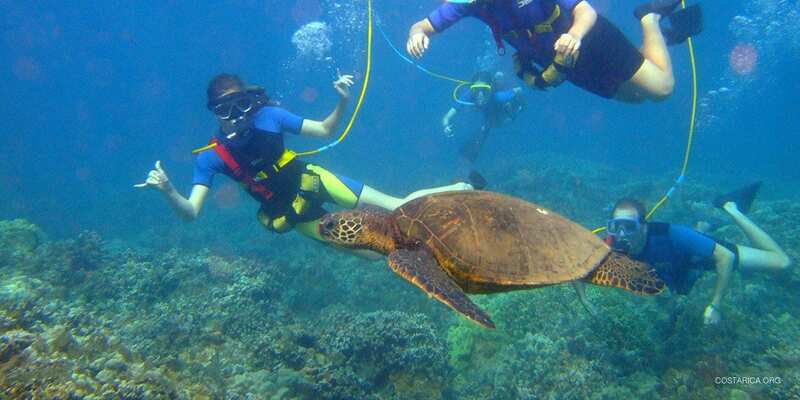 Snorkeling tours in Manuel Antonio leave from Quepos and last around 2.5-3.5 hours. Some tours are half-days. You’ll see a huge variety of marine life, including snappers, lobsters, turtles, snappers and coral!